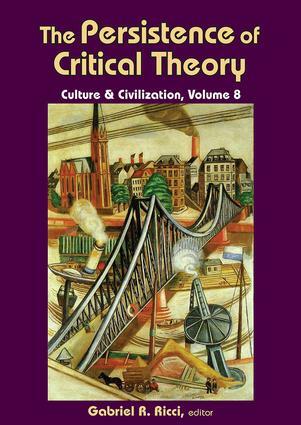 The latest volume of Culture and Civilization gathers contemporary exponents of critical theory, specifically those based in the Frankfurt School of social thinking. Collectively, this volume demonstrates the continuing intellectual viability of critical theory, which challenges the limits of positivism and materialism. We may question how the theoretical framework of Marxism fails to coordinate with the conditions that defined labor forces, as did Max Horkheimer and Theodor Adorno, or deliberate on the conditions that justify the claims we make through public discourse, as did Jurgen Habermas. Or, like Axel Honneth, we may reflect on recognition theory as a means of addressing social problems. Whatever our objective, the focus of critical theory continues to be the consciousness of established "positive" interests that, without debate, may sustain injustices or conditions which the public may not have chosen to impose. Throughout the hardship of punitive dismissal and exile in the 1930s and 40s, and the shock of the New Left in the 1960s and 70s, and finally the later linguistic and pragmatic turn, the Frankfurt School has sustained the idea that people escape disaffection and alienation when their knowledge of the social and political world is dialectically mediated through creative interaction. This new volume in the Culture and Civilization series continues the tradition of critical thought.